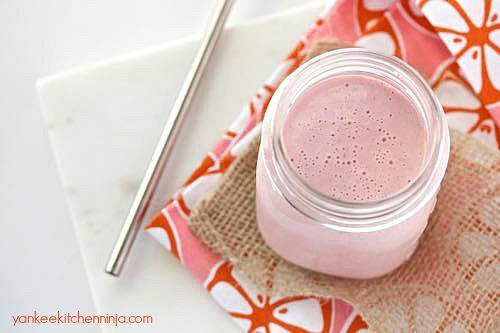 This delicious watermelon strawberry yogurt smoothie is packed full of protein, vitamins and other nutrients, making perfect for breakfast on-the-go. 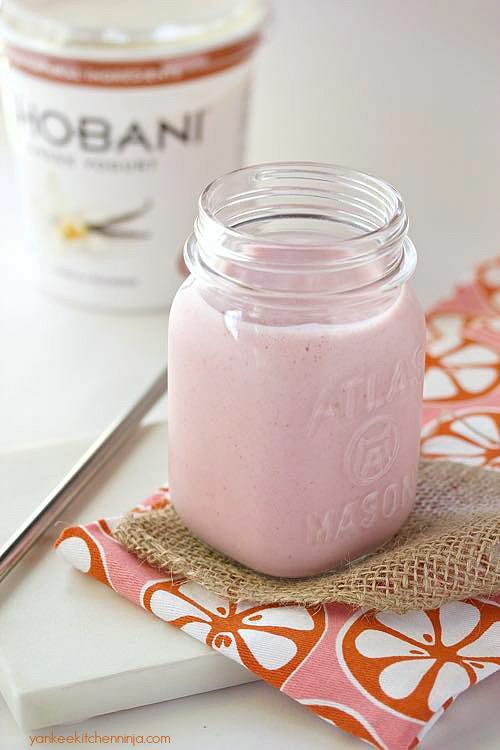 I included Chobani vanilla Greek yogurt because it's a great source of protein (especially when coupled with the cooked quinoa in this smoothie), tastes amazing and contains three different types of probiotics. 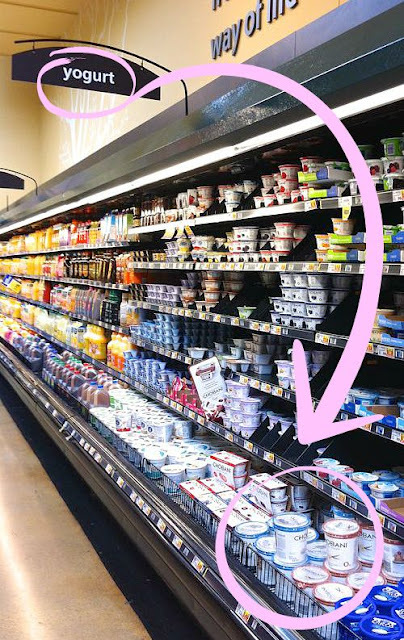 Plus, my healthy diet focuses on real food and I like that this yogurt doesn't contain artificial sweeteners or flavors nor any ingredients that are genetically modified. And speaking of sweeteners, this smoothie contains zero additional sugars or sweeteners -- there's no need to because watermelon is so sweet this time of year. But one thing this smoothie does contain is a little bit of stealthy nutrition. Regular readers know that Mr. Ninj is a bit of a picky eater; vegetables aren't really his thing. So for Mr. Ninj and any of your finicky little ones headed back to school, this smoothie contains, in addition to a huge boost of protein, some fiber-rich flax seed meal as well as a handful of baby spinach or, better yet, a tiny scoop of easy, DIY kale powder, which contains all the nutrition of a whole serving of kale in a form they won't be able to detect! It's a drinkable breakfast that tastes like a treat but packs a big nutritional wallop. And, lest you get sick of drinking the same flavor smoothie every day, simply substitute any two other kinds of fruit for a totally different taste, with all the same nutritional benefits. 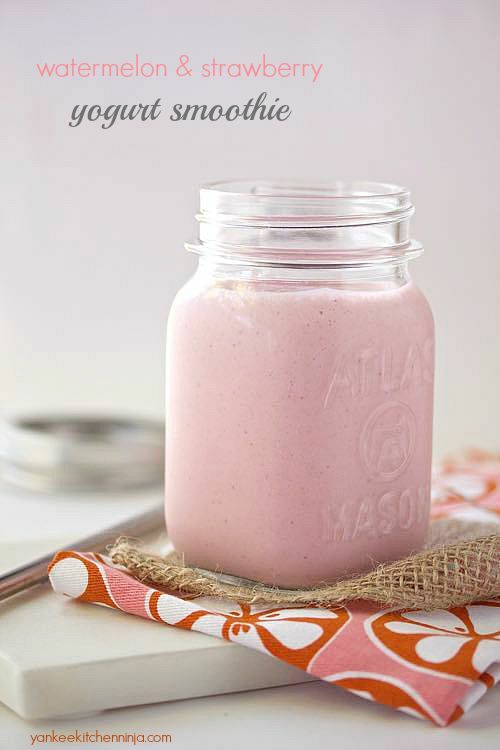 Or you can try using Chobani Greek Yogurt in strawberry instead of vanilla. Chobani is easy to find -- I get mine at Kroger -- and the large 32-ounce tubs are super handy. Plus, be sure to check out your local Kroger Family of Stores September 4-6th for delicious Chobani Greek Yogurt demos in-store. How will you be celebrating Smoothie Week? 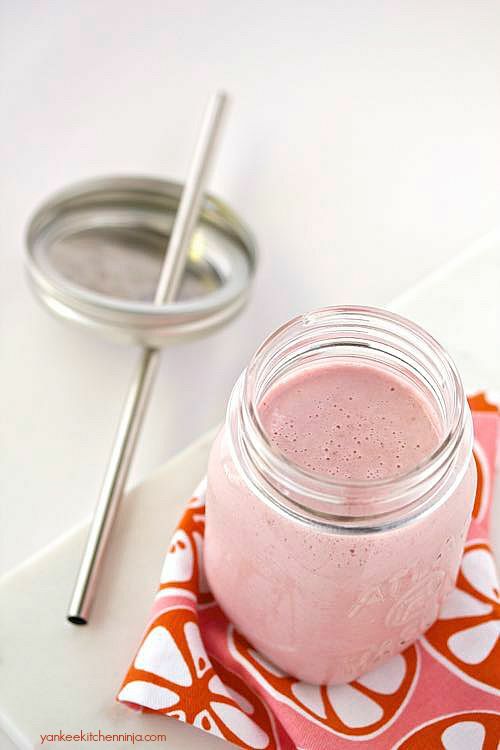 And what kinds of secret nutritional add-ins do you include in your smoothies? Leave a comment: The Ninj wants to know. You can use either fresh or frozen fruit in this smoothie; if you use all frozen fruit, you'll likely need to add a bit more milk as you blend it. And if you want a sweeter smoothie, you can blend in 1 or 2 dried dates as well. that looks and sounds delicious!! 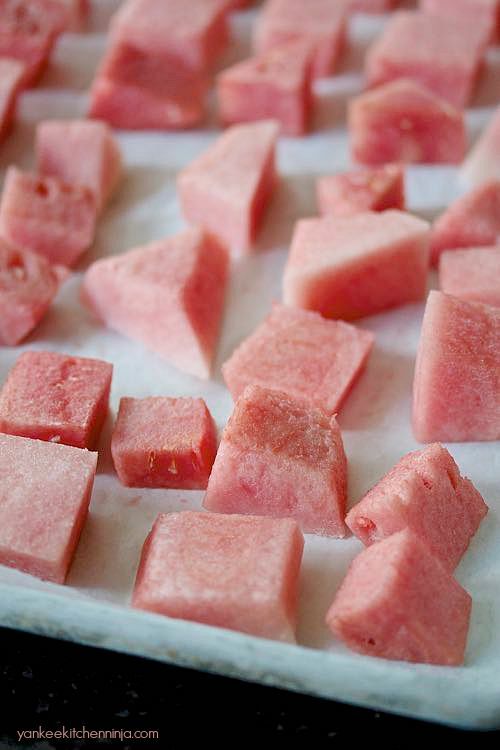 Great tip for freezing watermelon, I wouldn't have thought of doing that.